Built in 1904, for those looking to relax, Hotel Royal-Riviera has all facilities of a full resort with its own private beach, heated outdoor pool, fitness and wellness center. The 94 bedrooms and suites of the main building enjoy either mountain, sea or garden views, or in the case of several of the rooms, panoramic views of both the sea and the gardens. 15 rooms enjoy a mountain view with queen size bed. 50 rooms and 5 suites enjoy panoramic views of both the sea and the gardens. Royal-Riviera hotel offers a gourmet restaurant "La Table du Royal" with a pnoramic sea view terrace, a beach bar, a poolside bar, and a bar/lounge. 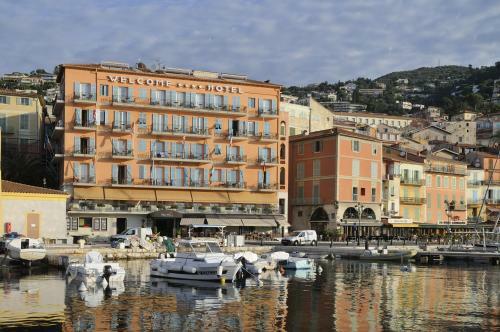 The Hotel Royal-Riviera is one of the few hotels in Saint-Jean-Cap-Ferrat offering a private beach, where guests can enjoy water sports from May through early October. Water sports available at the pier include water skiing, jet skiing, boat rental, and parasailing. The Hotel Royal-Riviera offers an ideal venue for all occasions whether for a board meeting, group incentive or a banquet. With an exclusivity option between October and March, it provides the perfect location for a private party or a product launch. Four meeting and banqueting rooms range from 42 m² - overlooking the garden, to 161 m² - with views of the sea and accommodating 110 people classroom style. In addition to the Panorama restaurant serving gourmet French cuisine, Hotel Royal-Riviera offers La Pergola, a 210 m² room, located in the gardens, right next to the pool and overlooking the sea, which can seat 110 people for lunch or dinner or 150 people for cocktails. Opened next to it this past summer is a new outdoor cocktail area for 50 people. The Wellness Center, features two massage rooms and a fully-equipped exercise room, offers an array of treatments and services for guests seeking Wellness Centeand renewal. The Wellness Center keeps a full range of Decléor products from beauty masks and make-up to specialized products for feet and hands in house for purchase. The new Treatment Pavilion is located in the gardens and surrounded by orange and palm trees offering the ultimate spot for relaxation. The massage rooms offer guests a selection of treatments featuring the Decléor line of aromatherapy body massages, facials, and cellulite and exfoliating body treatments. Located in the main hotel, and with direct access to the garden, the full-service fitness center allows guests to continue their health regimen during their stay. With 1,075 square feet of space, it is outfitted with a state of the art treadmill, as well as step and bicycle machines. rooms for men and women. Hotel guests have free and exclusive access to the fitness area from 8:00 am to 8:00 pm. For those looking to relax, Hotel Royal Riviera has all facilities of a full resort with its own private beach, heated outdoor pool, fitness centre and wellness spa. 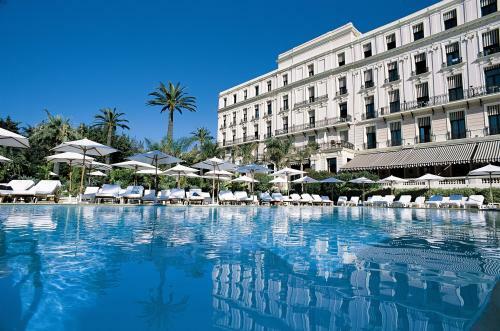 The heated fresh water swimming pool to enjoy the all year round sun of the Côte d'Azur. The Royal Riviera is one of the few hotels in Saint-Jean-Cap-Ferrat offering a private beach, where guests can enjoy water sports from May through early October. Water sports available at the pier include water skiing, jet skiing, boat rental, and parasailing. At the hotel Royal Riviera, the 78 bedrooms and suites of the main building enjoy either mountain, sea or garden views. or in the case of several of the rooms, panoramic viexs of both the sea and the gardens. L'Orangerie is positioned in the heart of the newly designed Provencal garden that surrounds the hotel. The villa's 14 rooms and two suites each offer a large terrace overlooking the garden and pool, or a balcony with a partial sea view. Decorated in a palette of lavender and orange sherbet, rooms feature ample closet space, a complete minibar, 3 line phone secure safe, and cable television with built-in CD/DVD player. Guest baths will be outfitted with white Calacatta marble separate showers, and oversized bathtub.